Spread the muffins on a cookie sheet, cut side up and toast for a few minutes until golden brown, but not too crispy. Slather each half with arugula pesto. Set aside. In the meantime, scramble the eggs slowly over low heat, scraping up the bottom as clumps begin to form. When the eggs are still very soft but not runny (i.e. almost done! ), add the mozzarella, chives, and salt to taste. Cook for another minute or two until the cheese is melted and the chives are well incorporated. 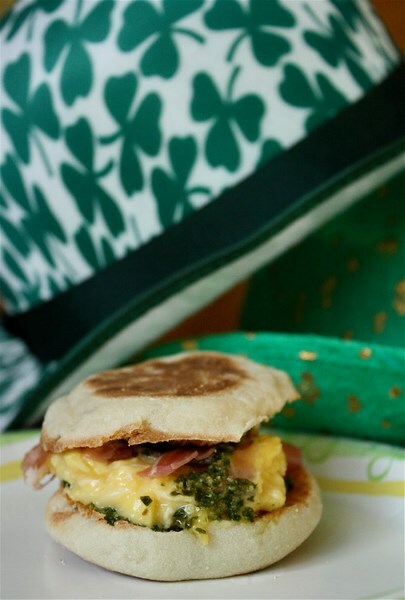 Set out the eggs, pesto-covered muffins, and prosciutto buffet style and allow your guests to make their own sandwiches.